Inspired by the helmet visors of fighter pilots, Oakley’s Flight Deck goggles are not only functional but also really good looking. What wins Best In Class for this goggle is the Prizm lens (offered on many Oakley frames and tested here in the black iridium color). This lens provides great definition in every light condition. The oversized goggle frame fits smaller faces and still provides an exceptional field of view. 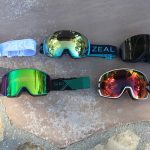 This is a high-price goggle for only a single-lens, but with the Prizm it is worth every penny. Oakley’s F3 moisture-absorbing coating seemed to do the trick, as we experienced no fogging during testing. This goggle has the largest (and most exceptional) field of view of any goggle we tested this year. The Prizm lens offers amazing definition and versatility. The Flight Deck also comes with a standard (non-Prizm) lens for a bit less money. While the oversized frame is a bit bulky and on the heavier side, it is solid and reliable. The Flight Deck is a great fit for a variety of face shapes. The face foam is cushy, comfy, and moisture-wicking.